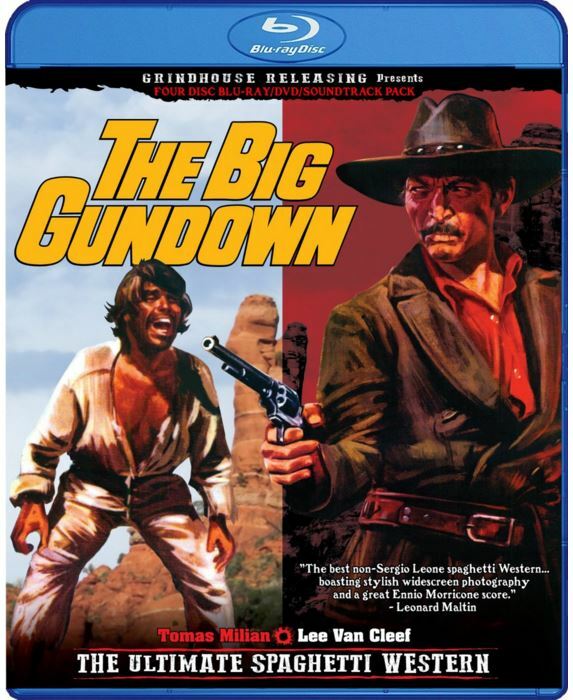 Last week I ordered Grindhouse Releasing’s multi-format edition of The Big Gundown. When the package arrived, I marveled at the raised lettering on the slip case. Something about the packaging is immediately inviting, which is strange because I usually don’t care about the cases themselves, just the movies. I didn’t expect what was inside, either. I imagined I’d be getting two or three discs, but four? With this edition, you’ll get the Morricone soundtrack, the American version of the film on Blu-Ray and DVD, and the Italian-language director’s cut, La Resa dei Conti with optional subtitles as opposed to dubbed voice work. I’ve listened to the soundtrack five times by now. I’m listening to it right now. I haven’t been this happy with a movie purchase in years. If you’re a fan of the film, you won’t be disappointed, either. Just stop reading this and buy it now. Sure, there are a few shots early on that look like they were lifted from a fuzzy source, but for the most part, the director’s cut is the definitive version and 98% of it looks better than anything I’ve seen in the last year or so. As far as presentation goes, it’s the best Blu-Ray in my collection at the moment. The movie opens on a trio of outlaws trying to outrun the famous bounty hunter Jonathan Corbett (Lee Van Cleef). What they don’t know is he isn’t following them. He’s already well ahead of ’em. When they fall right into his trap, he tells them they either get the gun or the rope. Meanwhile, he calmly proceeds to choose a single a bullet for each of the men. Fast forward to a few days later and Corbett is attending a wedding party where a Texas railroad tycoon (Walt Barnes) convinces him to run for senator. Corbett agrees to settle down, but only after going on one last bounty. After all, news of a fugitive child killer has spread to the party. Soon after the manhunt begins, Corbett thinks he found the guy. The suspect draws on him and Corbett guns him down. Corbett confesses disappointment, saying, “I thought he’d be smarter.” Naturally, the movie can’t end there and it turns out Corbett killed the wrong guy (conveniently enough, the wrong guy was wanted for murder anyway). We learn the guy he’s really after is smarter in a scene in which he gives Corbett the slip. The name of the bounty is Cuchillo and he’s played by Cuban actor Tomás Milián, who I think appears in makeup to make his skin darker. The filmmakers want you to believe Cuchillo is a master escape artist, but here’s one of my few complaints about the film: Corbett becomes uncharacteristically incompetent whenever he catches up to Cuchillo. The tricks Cuchillo plays on Corbett just wouldn’t work on the kind of godlike bounty hunter who can arrange a trap ahead of the outlaws who think he’s behind them. There’s a line later in the movie that kind of explains why Corbett gets downright stupid at times, but it’s a little bit of a cheat. The box art says Leonard Maltin called The Big Gundown the best spaghetti western without Leone’s name on it. I probably wouldn’t agree, but it’s up there—like, way, way, way up there—among the absolute best. There are plenty of great scenes, beautiful camera work, and a ton of production value. I am unconditionally in love with this film, particularly Grindhouse Releasing’s Blu-Ray presentation. It’s worth every penny.